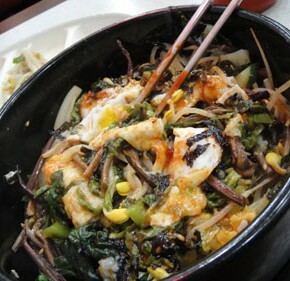 BIBIMBAP is one of the representative Korean dishes. The word literally means “mixed rice.” It is basically served as a bowl of warm rice topped with various cooked vegetables such as zucchini, mushrooms, and bean sprouts, plus beef and a fried egg with Gochujang (red chilli paste), which should be stirred thoroughly just before eating. For visual appeal the vegetables are often placed so that adjacent colors complement each other. With the twenty-first-century’s renewed interest in well-being, BIBIMBAP appeals to the world as an exclusive dish which brings us nutrition, taste, and fun all at once. BIBIMBAP has its own sensory tension to captivate mind and body. The glamour with a neat formality engages both the eye and tongue. First it catches the eyes; its various styles stimulating sense of sight is so striking that it earned the name “flower rice”. It is nutritionally balanced, and both color and ingredients balance yin and yang, the negative and positive cosmic forces. In choosing the ingredients, color is considered carefully, according to traditional cosmology. Each direction of the compass, the precise location of the diner and the season are all indicated by the use of traditional Korean five primary colours, which are blue (or green), red, yellow, white, and black. Blue symbolizes the east and spring, red is for the south and summer; yellow is the earth and the spot where one happens to be standing; white signifies the west and autumn; black is for the north and winter. Thus, Korean used to believe that having a bowl of BIBIMBAP meant one was absorbing the energy of the universe. Its gustatory deep and rich harmony comes from all ingredients balanced. Each one retains its own flavor within the profound and mysterious taste. There is not one dictator; everyone can be a protagonist in its harmony, so the combination makes them all great. At the same time, it has the flexibility to add or subtract according to the situations, seasons and economic conditions. Though there are not any compulsory forces to include all, it has the magnanimity to feel full and satisfied within a single bowl. This aesthetic of mixing shows a wide horizontal thinking, which can be linked and shared with different capabilities all together, while each character builds its self-esteem. It seems to say that in order to value our own characteristics, we must be able to respect and embrace the differences between others. Its elaborate preparations with various ingredients is as meaningful as eating. For truly tasty BIBIMBAP, Individuals should play to be ready for enjoying. Accordingly, every different taste can be interpreted by each person who mixes it. From the preparation to personal mixing, this time designs the slowness to appreciate the quality as well as the whole cosmic energy from the nature to our table. BIBIMBAP has not only a superb delicious sapidity, but also it represents a healthy food with an animal and vegetable proportion of 2:8. It could simply provide plentiful nutrition; carbohydrate, protein, vitamin, mineral and vegetable fat within a bowl. It is a well-being low calorie dish that contains every nutrient that is needed for a complete meal in a single bowl. Additionally, it includes the added advantage of being adaptable to practically any recipe, various ingredients are readily available year round. BIBIMBAP is creative as well as unique in that its color and appearance will vary according to ingredients used and personal taste. Depending on the recipes, infinite potential ranging from traditional to fusion style can be obtained. It does not need to conform one type by a fixed rule. Choose the ingredients that appeal to you — rice, vegetables, and protein — and make the dish your own. It gives you an opportunity to make your own, not follow the only one standard, which means you could be its master. 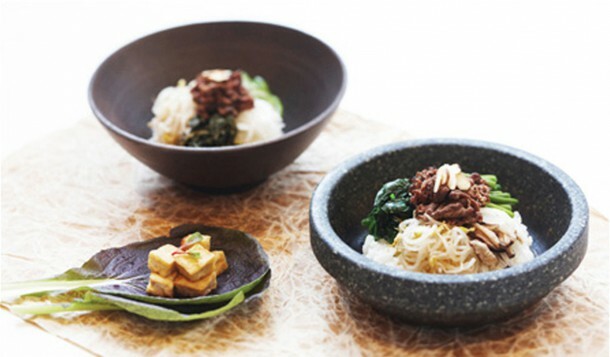 Enjoy your BI·BIM·BAP (비빔밥). This is a post by David Report contributor Jaeuk Jung.